I first made this for my other half about two years ago to convince him that broccoli, which he dislikes, isn't always that bad. The recipe itself is a bit of a cross between a dish my Italian cousin made for me, and a dish from the River Café Cook Book, which uses purple sprouting broccoli instead. I maintain that it is the perfect dish to give to someone when they say "I don't like broccoli". You can make the dish vegetarian by just omitting the anchovies and adding a pinch of sea salt just before you serve. Put a pan half-filled with water and a pinch of salt on the hob and bring to the boil. While you are waiting, prepare your broccoli: remove the bottom 5mm of the stem and discard. Then, slice the stem into 1cm wide slices and set aside. Divide the head into small florets - about 3cm in diameter each. Any additional stem, also slice and set aside. When the water has come to the boil, add the slices of stem and cook for about 5 minutes before adding the rest of the broccoli. Cook for a further 10 minutes, until all the stems are soft but not soggy. While the broccoli is cooking, finely slice the onions and fry in about a tablespoon of olive oil until soft and golden. Then, add the anchovies and garlic and cook for a further minute. Add half a glass of white wine and turn the heat down low so it simmers slowly - the anchovies should completely dissolve. Slice the olives into chunks, taking care to remove the pip, and set aside until the broccoli is cooked. Drain the broccoli, making sure to set aside the water, and add the broccoli and olives to the onions, anchovies and garlic. Fry for about a minute before adding approximately 6 tablespoons of the broccoli water. Reduce it slowly over a low heat and break up any of the larger pieces of broccoli with a wooden spoon. Add about two thirds of the parmesan and stir it into the sauce. Using the remainder of the broccoli water, fill the saucepan back up so it's around half full. Bring to the boil and add the Orrechiette (if you can't find Orrechiette, use Penne) and cook as directed - I used fresh, which took around 5 minutes. While you are waiting for the pasta to cook, set a frying pan on the hob and dry-fry the pine nuts for 2-3 minutes, until lightly golden. Once the pasta is cooked, drain and add to the broccoli mix. 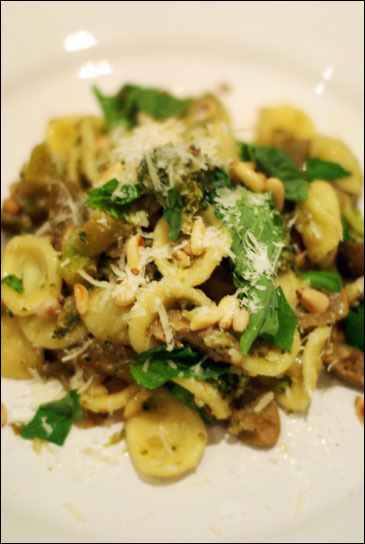 Stir in the pine nuts, transfer to a serving bowl and garnish with fresh basil leaves torn over the top. Serve with the remaining parmesan on the side to flavour to taste.